Schmetterling Aviation: Well, shoot, they actually published it! 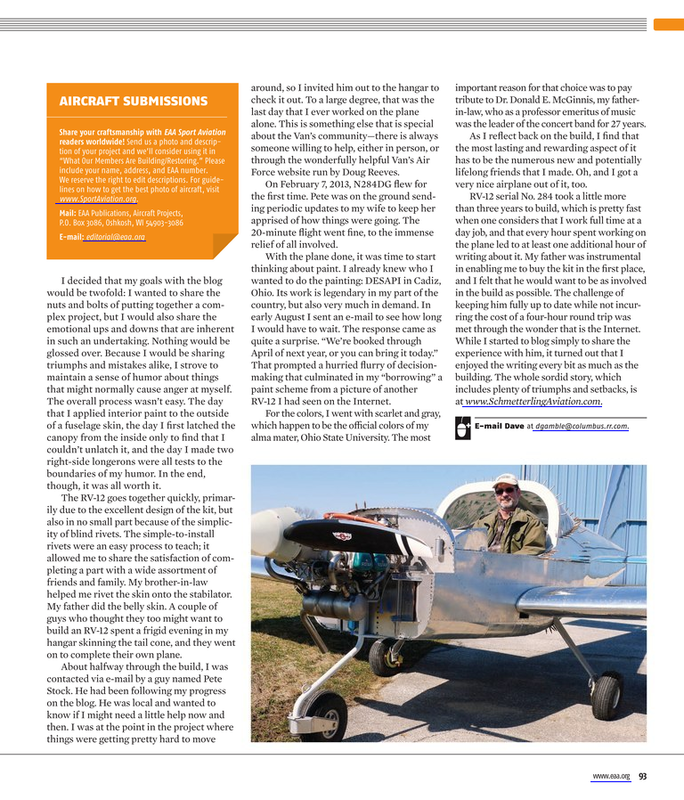 Way back in December, I thought it would be kind of neat if I could get EAA Sport Aviation magazine to post a picture of my recently painted plane in that section where they print a picture and a paragraph or two for five or six completions. I can't remember precisely what I wrote (which no surprise - I can't remember what I had for dinner last night), but it likely said something about matching every building hour with at least an hour of writing about it. Days went by and I had more or less completely forgotten about it when I received a reply declining to run my story. Instead, they asked, "could I write 1,000 words for a two-page spread?" Well, the answer to that is obvious: "No." After all, how would I hold myself to a mere 1,000 words after having expended something like 100,000 or more on the subject already?? I figured that with strict self-discipline, well, maybe I could do it. I remember being asked how I would know that it was a thousand words, to which I replied, "I'll know - I've been doing this for a long time." Cocky words, to be sure. But here is the honest truth: I looked at an example of one of the articles in one of the magazines I keep laying around for just such an occasion, started typing, rounded out and concluded the story, pasted it into a word processor that counts words, and asked for the result. 999 words. Great, because I had held an adjective in reserve! I sent the article off along with a link to a little over one hundred photos for them to choose from, and that was the last I heard of it. I pretty much wrote off the odds of ever seeing it in print when they did a two-page on a different RV-12 just a month or two ago. Until last Friday, anyway, when I received the June 2014 issue in my email (it was a link to the online version; the print copy will arrive in the next day or two). The link to the online version is here. What? How is it going to cause me trouble? 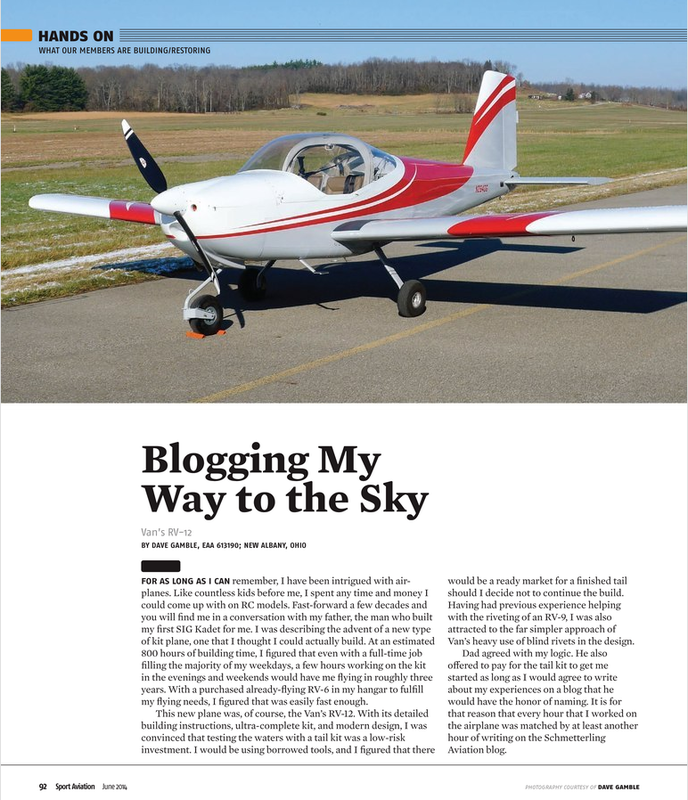 Well, consider this: my initial call to the tower from now until forever is now going to take the form of "Bolton Tower, Experimental two eighty four delta golf, as seen in Sport Aviation June twenty fourteen, page 92, five miles south, inbound, landing." So yeah, that's gonna be burdensome, to say the least. Speaking of talking to the tower, I have been thinking of upgrading my headset. No, not so that it will fit my ever expanding head as it grows to keep pace with my burgeoning ego, but thanks for asking. No, it's just that technology has improved greatly since I bought my Dave Clark 13.4s twenty years ago. No longer do you need to have big, bulky, sweaty headsets clamping the stems of your glasses against the side of your head and scratching the canopy when you bang into it in choppy weather. No, now you can spend around $1,000 for a bigger, bulkier headset that replaces the passive noise reduction of ear muffs with an electronic equivalent called ANR, or Active Noise Reduction headsets. These work by sensing the external sounds, inverting the sound waves electronically, and feeding that nullifying signal back into the speakers. Or something like that - it doesn't really matter because I don't want to have to fiddle with batteries and additional complexity. Oh, who am I kidding? The reality is that I don't want to spend a cool grand on it. As I was looking around for alternatives, I happened across a cheaper headset called a QT Halo that alleviates the 13.4 ounce weight issue of the old Dave Clarks and the discomfort of wearing them by weighing in at a very light 0.8 ounce. As a bonus, the also provide nearly ANR quality sound reduction by the simple expedient of piping the desirable sounds (ATC and intercom) through a small tube which is itself run through.... a foam ear plug. As I did my research, I found that there were sundry reports of these things being wonderful in all modalities (a word borrowed from my plethora of Nigerian pen pals) except in the notable case of the RV-12. This didn't surprise me - the intercom is a cheap POS and people struggle with getting the comm radio configured properly. There is also a recurring problem with the headset jack receptacles vibrating loose and creating a squeal (literally) over the loss of a good electrical ground. Needless to say, I was not keen on the idea of buying one of these things and not having it work. You will note that I said "cheaper," not "cheap." Luck was on my side: fellow RV-12 builder Bill H. turned up during my research, having bought a pair himself. I threw him a note asking how they were working out for him. They weren't. Bad sign, that. Not willing to quit without a fight, I asked if I could borrow one for testing in my plane. He sent two, but I refuse to test with the second one - the first will have to behave with one of the Dave Clarks as a neighbor. A headset with foam ear plugs is not something you want to share, and the Dave Clarks are going to remain as guest headsets. When the QT Halo was plugged first in, the nature of the argument between it and an older headset was immediately apparent. Because the newer technology and the aging of the old headset, there was a very large disparity in aural capability, which is a fancy way of saying that the Halo almost blew my ears out, while the Dave Clark was still whispering sweet nothings. After a little fooling around with the settings in the comm radio and the respective volume controls of the comm radio, intercom, and headsets, I got everything working well together. I have now flown with the Halo for about four hours and I really, really like it. Two of those hours came yesterday when Co-pilot Rick and I loaded up for a trip to The Farm for some shooting. The Jackson Two were to meet up at the airport we land at when travelling to The Farm at 9:30 am sharp. The CEO would pick us up in the plush Town Car used to transport such distinguished guests. It was all arranged but for one thing: how to get all that ordnance into the plane. Before you ask, I checked the rules for transporting firearms in Ohio. I couldn't find anything specific about light airplanes, so I followed the same rules I follow for carrying in a car which boil down to "in plain (or, in this case, plane) sight or in cases." The winds were essentially calm, so I gave Rick the left seat for the outbound leg. Note to self: let Rick fly left seat more often - the takeoff was about what you would expect after not having flown for so long. I'm glad it went well enough - had anything gone wrong that involved interaction with Federal authorities, it might appear as if we had been departing on an aerial assault of Indiana. The over-achievers (bugs that fly higher than ten feet) were out in force. The winds were favoring runway nine and we were approaching from the east, so Rick had an easy entry into the left downwind for landing. There was a brief wait at the airport for our ride because someone (and I'm not saying who...) forgot to call him before departure. You can safely follow the long-standing tradition of blaming the guy in the right (directional) seat if you'd like. He won't argue the point. It was a great day for trap shooting, unless you brought a civil-disturbance pump-action crowd-quieter. Things went much better with the over/under, as long as you didn't waste time trying to read the tag number on the fleeing clay. That's how it's done. Although... here I was wearing a bulky headset again. Can't win for tryin' sometimes. I thought I was doing really well, until I noticed that I had help. You have to look closely, but you can see the .40 brass heading right at my right shoulder. A couple bounced off of my hat too. Back at the airport, we found two fine looking aircraft, although only one of them was prominently featured in EAA Sport Aviation, June 2014, Page 92. I'll leave it to you to guess which one it was. Thanks for letting me fly again. Sorry for the crappy take-off and crappier landing. Fortunately, cameras weren't rolling. Also, if your brother saw the one pic of you shooting he'd swear you were aiming for his garage. Guess I better stop being (literally) two years behind on my Sport Aviation reading, huh? Or, maybe you'll prefer that I keep reading on my delayed schedule and remind you of Page 92 in 2016? Your call.